by Ian Sawyer If there was one movie from 2014 that deserved a sequel, it was John Wick. It was a fun action flick with fantastic stunt work, along with a spectacular comeback performance from Keanu Reeves. 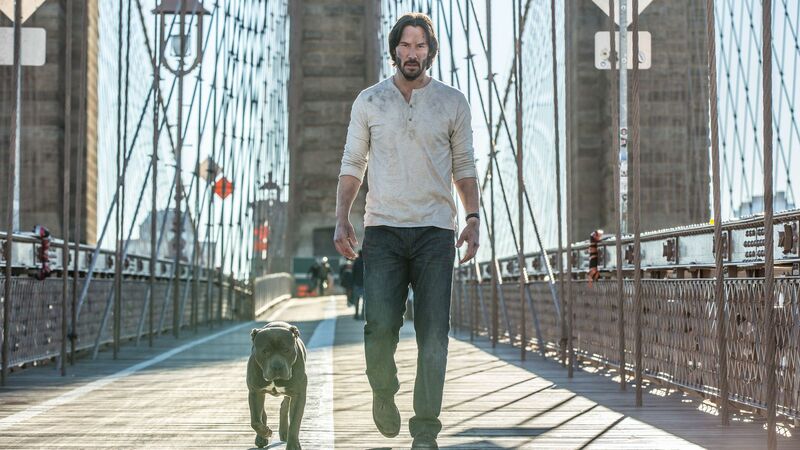 Ultimately, although it was a great film, the original John Wick fell a little bit short, mainly because of a lackluster final confrontation between John and the film’s antagonist. However, Wick is back with a significantly improved budget, and it shows. From the opening scene of the film, John Wick: Chapter 2 does its best to demonstrate that it is bigger, better, and even more fun than its predecessor. The stunt work in this movie exceeds the highly impressive bar set by the original. This is especially impressive when considering that Reeves, now 52, does almost all of the work himself. The set pieces in this movie are also greatly improved upon. Each one outdoes even the best scene from the original film. A standout is the (kind of) final fight that takes place in a colorful house-of-mirrors-type setting, which makes for some fun, tense action. And speaking of action, it should be noted that this film is significantly more violent than the first one. John does some up-close hand-to-hand combat, much of which is not for the faint of heart (I’m talking about you, pencil scene). Of course, that is not to say that John’s headshots have gone out of fashion. I quickly lost count of how many people John Wick shot in the head in this movie and to be honest, I don’t care. I’ve often heard complaints about the first John Wick saying that it’s not very realistic. If you are one of those people, do not see this film. It asks you to suspend your disbelief throughout the entire runtime, but it does so in a way that is very self-aware. Much of the film’s self-awareness comes from the sense of humor that it retained from its predecessor. This includes an emphasis put on Wick’s absurd relationship with the police, who seem to think that finding Wick dragging a body is perfectly normal. Although the comedy does not land as well, mostly because you expect it, it still does a good job of establishing the proper tone. This is not a film to take 100 percent seriously; it’s just something to have fun with and it delivers that in almost every way. Unfortunately, that leads me to one of the major flaws, which is that it occasionally tries to take itself too seriously. A certain decision made by John towards the end of the story requires an amount of emotional depth that the script simply has not established. The first film sees John go on a murderous rampage because some guys killed his dog and stole his car. Now, I was okay with that, because for the most part, that film understood exactly what it was. However, John’s rampage in this second installment begins for an even less appropriate reason (arguably), and he kills A LOT more people. That would be fine if the film did not occasionally stray into take-me-seriously-land, but it does, and therefore I have to fault it. The film often tries to humanize Wick, despite the various atrocities he commits, and it becomes hard to actually care. The only other complaint I have concerns the extended runtime. This movie clocks in at just over two hours as compared to the hour-forty-ish that the original film had. I wouldn’t mind if those extra 20 minutes had been used effectively, but there are some moments between the action which definitely could have been cut to make for a sleeker film. Other than that, I have nothing but praise for this film. Keanu Reeves once again gives a great performance as John Wick and newcomers to the series, Common and Ruby Rose work hard to hold their own. The end of the film will likely have some people rolling their eyes because of its unrealistic nature (yes, even for John Wick), but honestly, I loved it. No spoilers here, but the ending nicely sets up what will hopefully be an awesome third installment. If you can get past how unrealistic it is, John Wick: Chapter 2 is a great February flick. The film knows what it is, and it does its best to make the most of it. Please, give this film your money instead of Fifty Shades Darker; humanity needs you. Tags: Ian Sawyer. Bookmark the permalink.